The original Capena occupied the plateau of a nowadays uninhabited hill called La Civitucola, while present-day Capena was called Leprignano until 1933. The site of modern Capena has been inhabited intermittently since prehistoric times and continuous habitation began in the 11th century AD, when the Benedictine monastery of Saint Paul – now usually referred to as the Palazzo dei Monaci (Palace of the Monks) – was established on the tuff outcrop known as la Rocca. The main frontage of the palazzo faces the Piazza del Popolo, the largest public space in Capena. Originally simply called the ‘Piazza’, the square was laid out in the 16th century, when its clock tower was erected on the north side. The surviving monastery complex, with its maze of narrow and picturesque alleys, dates primarily from the Renaissance era, with extensive modifications in 1851. 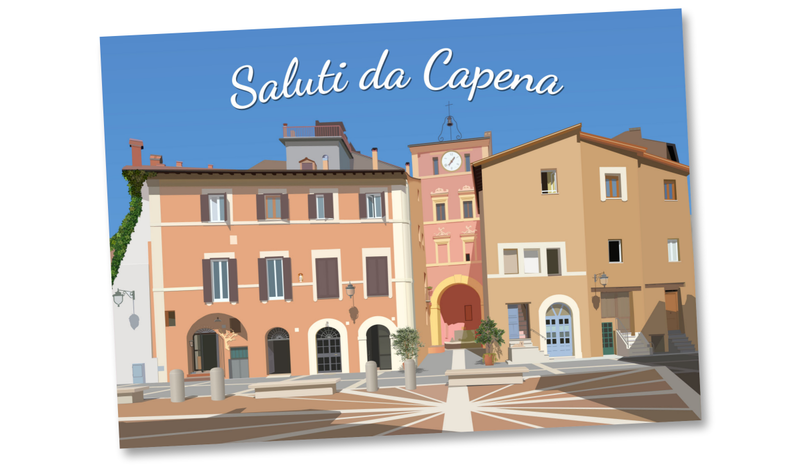 Throughout this website, you’ll mostly find Capena referred to as a ‘village’. However, with the construction of new resid­ential estates (and a prestigious, if seldom visited, gallery of modern art) on its outskirts in recent years, the municipality’s population has grown rapidly and is now over 10,000 – consti­tuting a town by almost anyone’s standards. Fortu­nately for visitors to the Casa Capena properties, these 21st-​​century devel­opments have had almost no effect on the old quarter, which still looks and feels like an antiquated, sleepy village. The villagers love an outdoor party and some kind of festival is held almost every month in Capena. Most of these events are long-​​established celeb­rations of saints’ days. Although shopping amenities are limited, Capena has a marvellous selection of restaurants for its size, most of which are eminently affordable. Shown below: a brief clip from the 1952 film Totò a colori, the first Italian movie to be shot in colour. Click the central ‘play’ button to view. The raucous action in the above scene whirls around Capena’s landmark fountain, the Fontana di Porta Nuova, close to Casa Marconi. Incid­entally, this unorthodox fountain spouts water out of taps jutting from its rocky base, not from the font mounted on top. Except for the presence of parked cars and the absence of extras, this part of the old quarter (or ‘centro storico’ as the municipality calls it) has barely changed in over 65 years.